Began series by looking at Psalm 121 which reminded us to set our eyes on the mountain knowing that God would watch over us. Have you ever set your sights upon one of life’s great mountain….and been terrified? Have you really wondered as the psalmist does: Where in the world is my help gonna come from? It is easy to hear this question in the psalm as a rhetorical one. And it may function that way as we read the psalm today. But I think we all know this is an honest question when we face a challenge or obstacle in life that seems to great to tackle. If you stop with this first line of scripture, it sounds terrifyingly honest. The mountain seems too high, too steep, too rocky, too dangerous. And so instead of climbing, we stand at the base…frozen, stuck, mesmerized by the size of the task ahead, pulled into the weight of what the climb will mean for our lives. Perhaps you sit at home after hearing a doctor speak the words cancer. You know only a small portion of what lies ahead in treatments with chemo and radiation. And you are paralyzed to do anything because the whole situation just seems unreal. You ask: Why me? How am I gonna do this? There is no way I can make it through this. Or, perhaps there are only a few days left before a big project at work is due or just a few days before a big family event. You realize, there is no way you can get everything done in time. The reality sets in. There aren’t enough hours in the day. Something isn’t going to arrive on time. A vendor cancels. Someone gets sick. And finishing on time becomes impossible. Or maybe you did something you knew was wrong. Maybe it was an accident. Maybe it was negligence. Maybe you just didn’t know the outcome would be so bad. Maybe you didn’t think you would get caught. But here you are. Someone knows. And now you are faced with the mountain of confession and repent each and needing to be forgiven. But you are embarrassed. You know what you need to say and do. But how? What’s the best way? What words should you use? Will folks believe you? Can you handle embarrassment you’re feeling? Maybe it’s just a choice you need to make in life. A habit you know you need to break. You’ve been pretending it’s not as big deal for far too long, but deep down you know it’s a crutch. You say you can stop anytime, but you don’t. You just put it off. Deep down you know it’s because breaking that habit it a mountain you don’t want to climb….it feels like you don’t need to or want to or just to big to tackle in your life right now. And folks, no matter what that mountain is – health, job or a goal, a mistake, a habit or something else – you find yourself standing there looking at the mountain paralyzed to do anything. Folks here’s what happens far too often: Instead of climbing that mountain, you start carrying the mountain. Instead of taking that first step or next step like we talked about a few weeks ago, you pick up worry and anxiety and stress and embarrassment and tension and uncertainty from the mountain and throw it over your shoulder. Or like a poltergeist, the mountain jumps onto your back overwhelming you as you feel the size and weight of it. And you just keep going through the daily motions with that mountain weigh in you down every moment of every day whether at the forefront of your mind or hidden back in the recesses of your consciousness. Folks, some of us have been carrying mountains instead of climbing them. Some of us are staring down the mountain and become mesmerized by it, sucked into its immense-ness and paralyzed to do anything. Some of us have spent too much time looking at what too big to tackle, or is wrong with ourselves, what is wrong with the mountain. And instead of climbing that mountain, we’ve create a burden to be carried instead of a problem to be solved. I suspect there are more than three, but these are three helpful ways to think about as we try to understand why we stand frozen unable to move forward. Last Lent, as we explored our missional calling as a church, I shared with you some very practical steps that community organizers use that I believe are directly discernible from scripture and so helpful in getting us to act on the mountains we face in life. I call them the Cycle of Action or the Cycle of Change. We looked last Lent at how these steps show up in the Bible, specifically we talked these steps through a some changes the early church had to make found in a story from Acts 6. Go back and check that out on our website under the sermon title – Mission: What If there’s more to do? But even when you follow this cycle, even when you take that step of faith forward as we talked about a few weeks ago – that first step of faith which begins to forge a path up the mountain – even when you do these things, you can still get stuck looking at the mountain. You can still find yourself carrying the load of that mountain on your back through fear and overwhelmed-ness, through anxiety and uncertainty, through second guessing and through all kinds of different emotions that freeze you in your tracks. And climb you can. Just take a step, cast your cares upon Christ (as the old chorus goes). 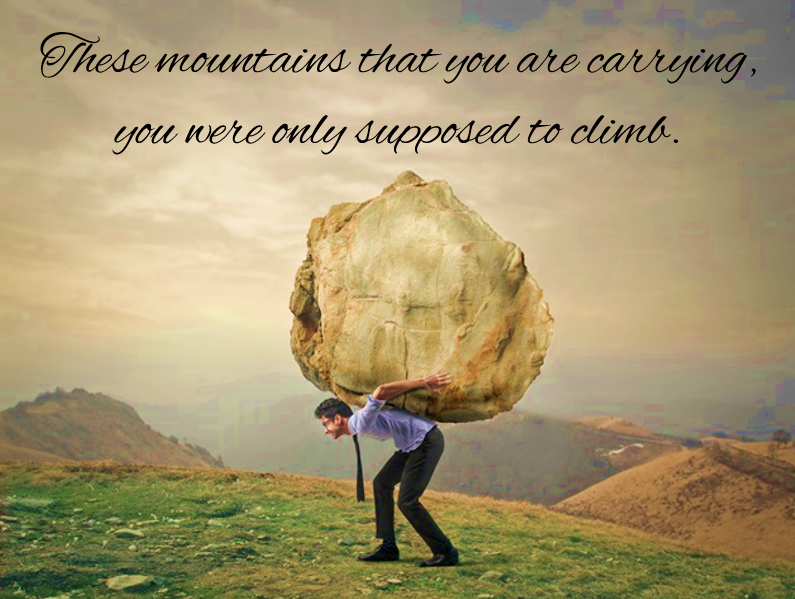 Get out of your paralysis and climb the mountain for it was never meant for you to carry. God will guard you. God will protect you. No matter how difficult, how rocky the trail, or how dark the journey. God is with you. Just get going!